Super Savings Item! Save 32% on the ISENXI for Apple Watch Case 38mm,5 Pack Soft TPU Ultra-Slim Lightweight Bumper Scratch Resistant Protective Case Cover for Apple iWatch Series 3 Series 2 (5Pack) by ISENXI at Kode Fu Guru. MPN: DDBHK38-F. Hurry! Limited time offer. Offer valid only while supplies last. 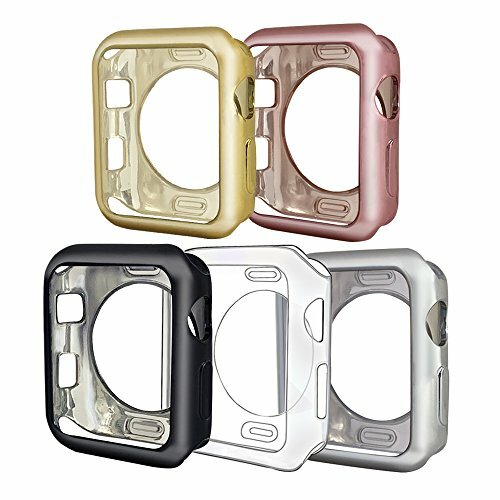 Made from soft and durable TPU,soft and flexible,No smell and no deformation. Multiple plating processing is applied to prevent the case from fading and corrosion, thus making your watch always sparkling as new one for a long time. Provides access to all ports, buttons, features, so that you can have full use of your Apple Watch without needing to remove the case. Fits your iwatch well:covering your watch side and edges perfectly,note not including the screen because it affect the using experience.Easy to install or remove conveniently. Compatibility:The apple watch cover perfectly works with apple watch 38mm series 3 series 2 series 1, iwatch Sport/Edition/Nike+. If you have any questions about this product by ISENXI, contact us by completing and submitting the form below. If you are looking for a specif part number, please include it with your message.